This winter break I had to go to my backup of Japanese dramas to get through this dry spell of good Korean dramas. Or rather I just could not find the same passion I had for Kdramas in the previous years. I found a few gems but N no Tame ni is undoubtedly my top drama this year. I started watching it as a filler drama. A filler drama is just a drama I watch to distract myself while I wait for another episode to air from whatever crack drama I’m currently watching. At first, N no Tameni pleasantly surprised me with its thriller suspense undertones. However, soon I was completely invested and submerged in the story. For the record, N no Tame ni means The Testimony of N. I love how mysterious the title is. There are three main story lines. The first is of Sugishita Nozomi (Eikura Nana) and Naruse Shinji (Kubota Masataka) growing up together on an island in the Seto Inland Sea. The two high schoolers both have difficult family situations and find solace in each other. The summer before they apply to college, a fire burns down Naruse’s family owned restaurant under questionable circumstances. Takano Shigeru, the island’s police officer, is suspicious of the two teens but there is no evidence to prove either is the arsonist. The second story line occurs after Sugishita and Naruse separate and both leave the island for college in Tokyo. University student Sugishita moves into a run-down apartment complex and befriends her neighbors Ando Nozomi (Kaku Kento) and Nishizaki Masato (Koide Kaisuke). Together for the sake of their beloved landlord, they execute a plan that ensures the apartment complex is safe from being taken over for development. However, in the process, the three friends become embroiled in the murder of the wealthy Noguchi couple. Even Naruse is pulled into the situation. Nishizaki confesses and is put to jail for the murder of the husband, but the story does not add up. The third storyline takes place in the present. Retired police officer Takano Shigeru desperately pursues the truth in both cases. Each of the characters are questioned, and the truth is slowly revealed. My lame summary is insufficient to show the suspense and mystery of the whole drama. But what was intriguing and struck me is the connection between the characters. I love Japanese dramas because of the way some things are just not said. Words are not needed to convey emotion. The young actors in this drama can demonstrate a myriad of feelings through one glance or simply reaching out their hand. The drama doesn’t skimp on romance either. The romance is not petty, childish, nor argumentative. It is sacrificing, slow, and understanding. It does not pretend that first love is the final love. I still don’t know what to do with myself 2 days 2 weeks now after finishing this drama. Each of the characters have burned themselves into my heart and mind. I pity Sugishita, the girl who spent her whole life fighting to survive. I feel injustice that the writer had to give her stomach cancer at the end of the story. It seems like trite plot device at first glance, but the more I think the more I feel like it was necessary for the plot. Sugishita needed to be grounded and to realize the value of life and to slow down. She fought so hard to survive she forgot how to live. As for the love triangle between Sugishita, Ando, and Naruse, I felt like it was executed perfectly. This love didn’t need to be portrayed through fistfights. Although there were numerous missed chances and misunderstandings in between, each character sacrificed themselves to show their love. We find out Ando was most important to Sugishita at the time of the murder. Sugishita might not have ended up with Ando in the present day, but she knew she had to let him go so he could reach the heights they together dreamed of. He could not know of her cancer because he couldn’t be held back from achieving his ambitions. In a way, Ando would be living for them both when she passes. On the other hand, I think she found solace in Naruse and chose to spend her last days with him because he was essentially family. She could live out her life enjoying the simple beauty of things and not be burdened or tempted by what her life could have be. Going back to the island would bring her life full circle. She could find the genuine innocent happiness she once had with Naruse as a teenager. The Noguchi couple do not make much sense to me. The husband beats the wife, but the wife is obsessed with the husband. I understand this could happen from a twisted psychological viewpoint. The writer uses this as a big reveal to resolve the mystery but is pretty surprising. It was hard to stomach that the wife’s whole agenda in life just revolved around her husband, especially since she seemed to genuinely reciprocate Nishizaki’s love. I have some doubts about this part. 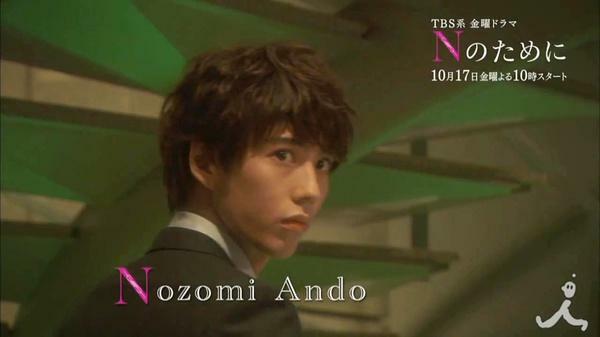 Ando Nozomi’s character was actually a weak link out of all the characters. His background is not clearly portrayed so we do not understand the origin of his ambitions and his straightforward honesty. He loves Sugishita because they are so similar but its hard to understand the basis of their similar. Sugishita and Nishisaki’s childhoods overshadow Ando’s character and makes him fall a little flat. However, I have come to love the actor Kaku Kento. He’s 100% my obsession of the month. I wish he were the main character in more works because I need more of him. Give me more Kaku Kento! Whee! So many of us took refuge in J-doramas. I know I did! Thanks for the rec, I’ma put this on my list. I marathoned Border during a fallow K-drama period and it was one of my top watches last year, and this one sounds like it would similarly be a great watch! Hi carrotblossom, how are you a year after finishing watching the show? It’s only been less than a week for me (such a late camper, I must have been living under a rock) and I still don’t know what to do with my life. I thoroughly love each and every main character. I just genuinely wish they got to live happily. Granted, my favorite moments are when Sugishita and Naruse were in the island back when they were younger (minus the angst, of course) but that “… Ando would be living for them both when she passes” and that “… she found solace in Naruse and chose to spend her last days with him because he was essentially family. … Going back to the island would bring her life full circle. She could find the genuine innocent happiness she once had with Naruse as a teenager”, this is perfect to describe how I see (or hope) the characters were feeling (or would eventually feel). Thank you for the review and I’m just happy there’s someone who I believe can understand my love for the show. We might not know each other but would you mind to share ‘ultimate love for the show’ with me? (kekeke, I’m being melodramatic and I apologize if I made a lot of typos. It’s because my sights are blurred but I promise it’s because I’m cutting onions right now). Just stumble on your blog. somehow it’s harder to find blog talking about jdorama compare to kdrama eventhough in term of plot and quality, jdorama beat kdrama by a long mile. Till the end of this drama, I believe that Nozomi love Ando, but in real live her relationship with Naruse has higher chance to work. It will be so unhealthy in Nozomi-Ando’s case, although they may love each other but Nozomi will keep everything to herself and Ando keep believing that Nozomi will not need help. As in Nozomi-Naruse, there’s deep understanding between them so in this case they’ll lick each other wound. PS: is it just me? but while watching this dorama I keep seeing Ueno Juri, Nishikado Ryo, and Taka (One OK Rock) face in these three characters. It may be the lighting or hairstyle, but it some scene they so look alike. Some really good content on this internet site , thanks for contribution.